The Heinkel He 45 was a light bomber produced in Germany in the early 1930s, one of the first aircraft adopted by the newly formed Luftwaffe. Its appearance was that of a conventional biplane and included seating for pilot and gunner in tandem, open cockpits. 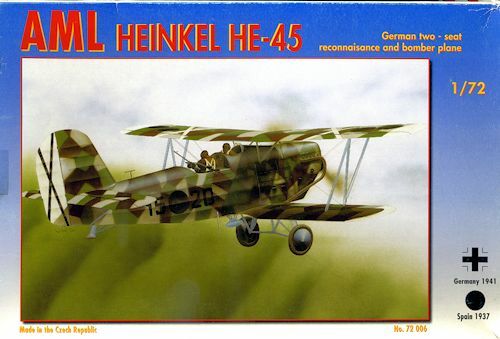 Developed in parallel with the He 46, it appeared in 1931 as a general-purpose biplane and was employed mainly as a trainer, but was also used by the Luftwaffe for reconnaissance and light bombing duties. Production of this plane totaled 512 aircraft, including those built under license by Gotha, Focke-Wulf, and BFW. I'm not sure how long this kit has been out, but looking at it, I would hazard a guess as to at least 15 years. It is your standard short run kit that is fairly nicely molded with lightly engraved detail. Most of the parts have some rather heavy mold seams or light flash, but nothing major. Sprue gates are of a medium size and often will encroach upon the parts themselves. I was pleased to note that the wings and tail bits were single castings. The two windscreens offered are in vacuformed plastic. 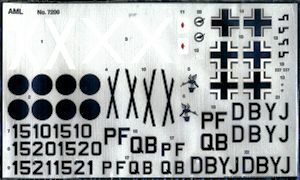 A photo etch fret is included that is primarily for the interior (etched instrument panels with acetate instruments and etched seat harnesses). There are rudder pedals for the front seat along with a control stick. The rear seater simply gets a flat seat. The gun mount is made up of plastic and photo etch bits. This is not required with all planes as the trainers would not be armed. Framing detail is provided on the interior walls of the fuselage halves. The upper engine cowling is a single piece so no seam through the middle of it. All the flight surfaces are provided with pins that fit into sockets in the fuselage. I like that the upper wing is a single piece. So are the N struts used for the wings and cabanes. The rather complex-looking exhaust is two pieces with well defined mounts. Instructions are well done with color information provided during the build. There are four markings options. Two of them are from the Spanish Civil War with the box art plane in a four color camouflage. The rest are listed as being overall RLM 63. PF+QB has a yellow fuselage band as was with A/B 24 in 1941. The other school plane is DB+YJ with the Reconnaissance Flying School in early 1940. I'm sure some reasearch will turn up other possibilities as these planes were used as unit hacks as well. The decals are nicely done and should cause no issues. I've darkened the sheet so you can see the white bits. Rigging information will need to come form the box art or the full color painting guide for the box art plane on the back of the box. Well, once again, I'm sucked into a kit of a plane that I'll probably never build, just because I like the subject. I'm not sure how available this one is, but if you are into pre-war Lufwaffe or Condor Legion stuff, this is a kit you should seek. Thanks to me for finding this one.